The Arrowood Zoo: Homesteading - Why Backyard Chickens? My family got started with chickens many years ago when we moved into a home where my brother was moving from and my dad and him had some chickens that was going to stay in the chicken house there on the land. We didn't know anything about them and I was not looking for something else to feed or clean up after! Little did I know how much we would grow to love raising and having chickens. Fast forward 10 years or so and we still have chickens and love them. Over the years I have learned several benefits to having them and I want to share that with you. Healthy food that you know everything about. You know what the chicken has ate and for how long. If your goal is to eat the chicken as we have done you know how healthy your food is before you eat it. We love getting fresh eggs. If you compare the fresh eggs to store bought you will notice a difference in color and taste! Trust me fresh chicken eggs are better for you all around. We do rotate our chicken flock by slaughtering the chickens and replacing with new ones. We love having the fresh chicken that we know was raised healthy and without hormones and steroids. Backyard chickens help with bugs! If you allow them to free range you will notice that you will have a decrease in the pests that your other animals fight or your children. Fertilizer! If you grow a garden or have plants that could use some help their poop is a great natural fertilizer. Chickens are very easy to care for. Depending on the amount of land you have you will not have to feed them unless you want. We do feed our chickens food from the supply store however they also get table scraps and special treats from us that we make for them from time to time. 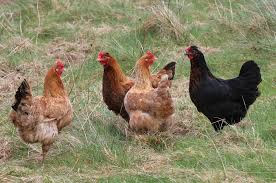 Also our chickens free range in the fall so they enjoy a lot of bugs and worms. If you have children allow them to care for them, it gives them a great responsibility. Last but not least they do make a great pet. Yes, if you have children more than likely they will be a pet for them.